TULALIP — Santana Shopbell has eight siblings, most of them grown. She is the second-youngest child, but she is about to distinguish herself with a big first. 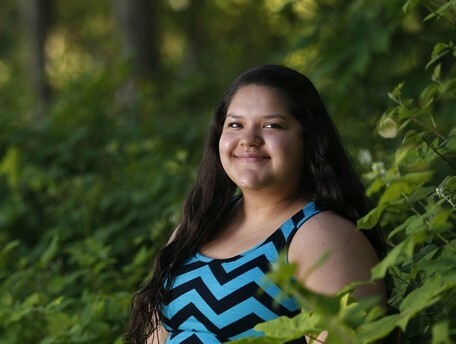 When she graduates from Tulalip Heritage High School on Saturday, Santana will be the first in her immediate family with a high school diploma. “It was a struggle. I had my doubts,” said Shopbell, 18. Her focus on a goal — to graduate, and to set an example for more than 20 nieces and nephews — grew until doubt was edged out by accomplishment. “I just kept at it,” she said. Her toughest course was geometry. Math teacher Jennifer Ham was a great help. She went all four years to the small school that shares a campus with Marysville’s Arts & Technology High School and 10th Street Middle School. Heritage has fewer than 100 students. “You get one-on-one time with teachers. You learn more about your culture, and other cultures,” she said. Shopbell lives with her father, Rockey Shopbell, an older sister, a younger brother and an uncle. When she was 11, the family suffered a terrible loss. Her mother, Peggy Jones Shopbell, died. It was love of family that helped her through. Today, family is everything. “I like hanging out with friends — and my friends are my nieces, nephews and cousins,” she said. She also loves her community. A member of the Tulalip Tribes, she recently volunteered at a luncheon for tribal elders. She has helped with children through Tulalip Youth Services and has volunteered at the Marysville Community Food Bank. She expects her next academic step to be Everett Community College but doesn’t plan to enroll until next spring. “I want to take a break,” she said. She hopes to get a job and a car, and do some traveling. A high school highlight was playing basketball her senior year. Her Heritage team went to the state B basketball tournament in Spokane. She had never played before. She also played volleyball in high school, was a student-body ambassador and president of the science club. Someday, she hopes to work in tribal government. A role model is Deborah Parker, a member of the Tulalip Tribes board of directors. First, she’ll celebrate. “We’re having a big graduation party with lots of family. They are really proud,” she said.